Banding with therapist Suki , raw food chef Shanti and a bunch of kindred spirits this group of individuals transformed into the Alchemy team, their concept, “ To promote heart-based culture and set the intention for unconditional love, authenticity, health, and gratitude.” Each day seemingly innocuous ingredients like beans, seeds and nuts are turned – as if by magic – into wonderful tasty treats, like cashew cream cheese, crackers and raw chocolate truffles that look deliciously naughty – but actually are not. Only local and organic produce grown in Bali is used, and all fruit and vegetables are washed in Reverse Osmosis water before juicing. Rich in nutrition and vitamins, juices are specifically designed to cleanse, detox, and energise, and are served strained, sugar free and with an optional papaya stem straw. 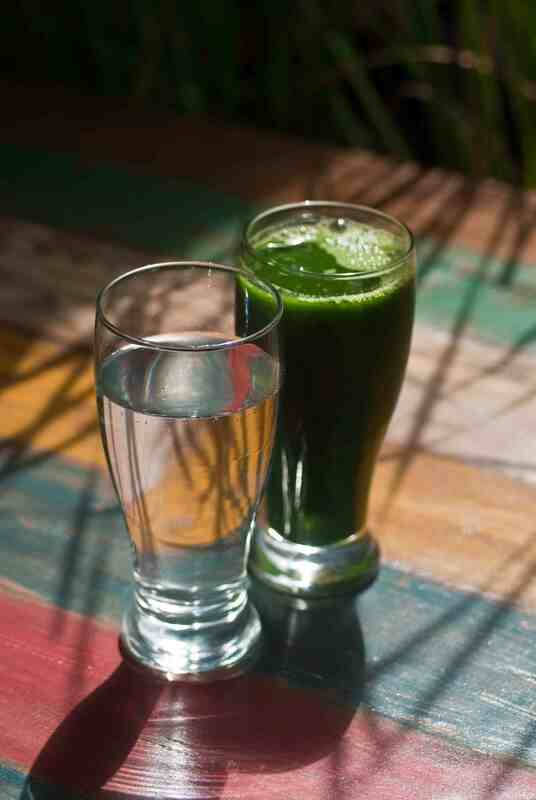 ‘Fennel love’ blends the sweetness of apple with anise-like fennel and a dash of lime, the ‘emerald’ comes with kale, cucumber and apple, while the ‘classic green juice’ has an earthy mix of fresh leafy greens. The salad bar makes an enticing display with its healthy selection of innovative salads, toppings and dressings that change daily. We are all familiar with the nutritional benefits of eating fresh fruit and vegetables, but what many don’t realise is that a raw diet can incorporate just about anything you could think of, from breads to cakes, biscuits, burgers and crisps. The only limit is imagination, and with creative chef Shanti at the helm there obviously isn’t any shortage of that. While the process of cooking can destroy much of the natural goodness of food, by using a dehydrator, food is gently heated to 43 degrees Celsius, which keeps all the nutrients, enzymes and vitamins intact. This is also the secret to producing their wonderful snacks like flax seed and almond crackers, onion bread and crunchy kale chips. 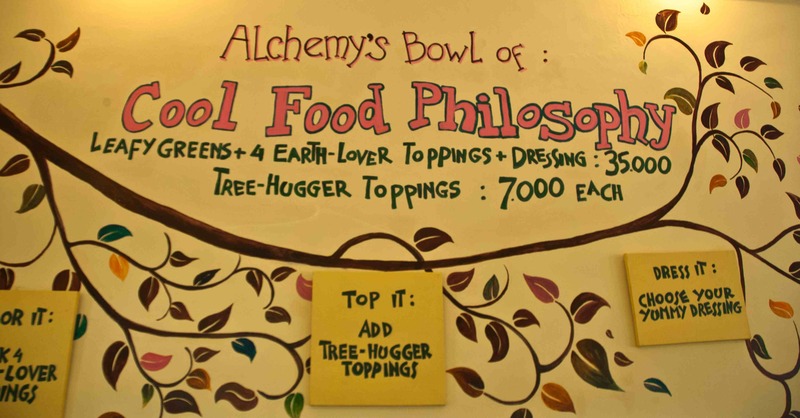 The real magic of Alchemy is probably the gleaming refrigerator shelves stocked with a dazzling display of cakes, candy and chocolates that don’t just taste good, they are good for you. Where to start? Perhaps the ‘orangutang’ with its creamy blend of fragrant chocolate mousse, cocoa crust and essential orange oil, or maybe just head straight to the homemade raw chocolates. 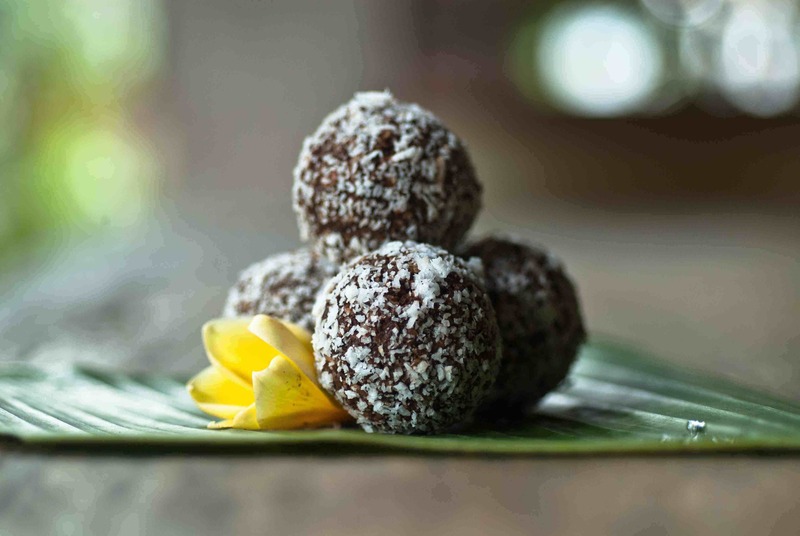 There are dense and gooey slabs of chewy chocolate bars, coconut dusted truffles, mochaccino cups with a rich filling of cold pressed coffee, energy balls, and divine raw bounty bars filled with fresh shredded coconut. Nutritious, magnesium rich and high in antioxidants – raw chocolate is a world away from manufactured confectionary that is full of chemicals, refined fats and sugars. The taste is extraordinary, as is the effect, as raw chocolate is packed full of the compound Anandamide – also known as the love chemical – which induces feelings of bliss, much like falling in love. More than just a café Alchemy is a way of life, as Suki says, “Our focus is to bring together community through a love of vibrant foods, healing (our clinic upstairs offers colonics, acupuncture and live blood analysis) and monthly chocolate dance parties.” Alchemy celebrates its first anniversary on 24 September with an extravaganza that will include a Mayan cacao ceremony, fire spinning, guest speakers, live entertainment, complimentary juices and of course, plenty of chocolate!